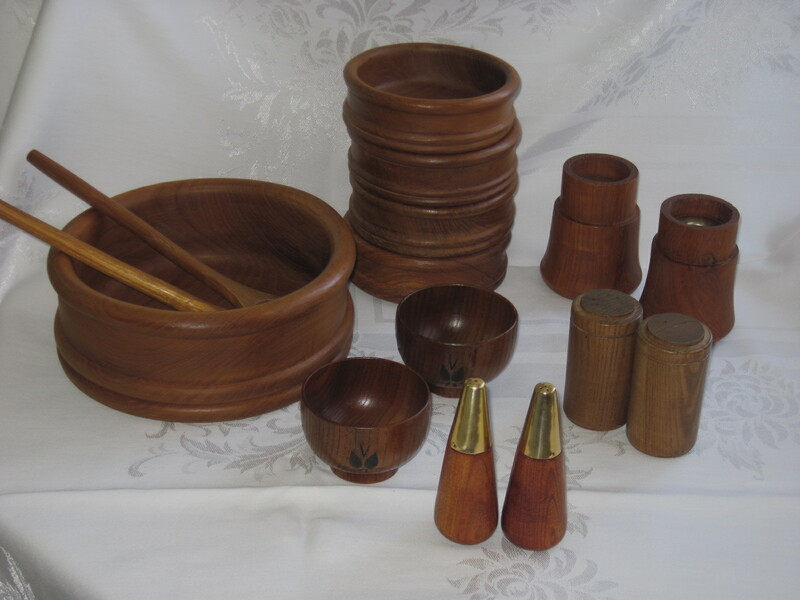 Here are a few examples of Mid Century Modern Teak kitchen ware. There is a large salad bowl with 4 individual serving bowls and salad servers, made in Thailand. There is a pair of candle holders, 2 sets of salt and pepper shakers and two small bowls. All these items will be available at the Ottawa Antique and Vintage Market on March 21 and 22nd, 2015 at the Carleton University Fieldhouse Show where I will have a booth set up. If you like mid century kitchen items, visit my booth at the Almonte Antique Market, 26 Mill Street, Almonte ON, just 30 minutes west of the city of Ottawa. Open year round, daily from 10am to 5pm. The buidling is home to over 50 different vendors. Please note that all these items are now SOLD!!! !